It’s 5.30pm. We’ve been out exploring and have just returned to our base in Betancuria, the former capital of the Canary island of Fuerteventura. It’s a bit of a tradition at the end of a long, hot day of exploration to sink a long, cool beer. The first place we try is just shutting its doors for the day, so is the second. We spy some people sipping cervezas at a third. Bingo. We order our beers and sit in a hot sun which doesn’t seem to know it should be losing its heat by this point. Half an hour later this place would have been closed as well. At two in the afternoon the prettiest town on Fuerteventura bustles with day-trippers. Its immaculate, flowery cafés and restaurants are filled with people. By eight in the evening it’s a ghost town. There’s not one place left open in which to eat. 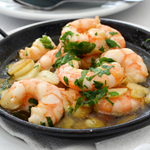 There are two beautiful restaurants serving creative tapas a short drive away… both closed after the day-trippers have returned to their coastal resorts. Thankfully our rural hotel, Casa Princess Arminda, does dinner. It’s an eye-opener which reinforces something we’ve known for some time. 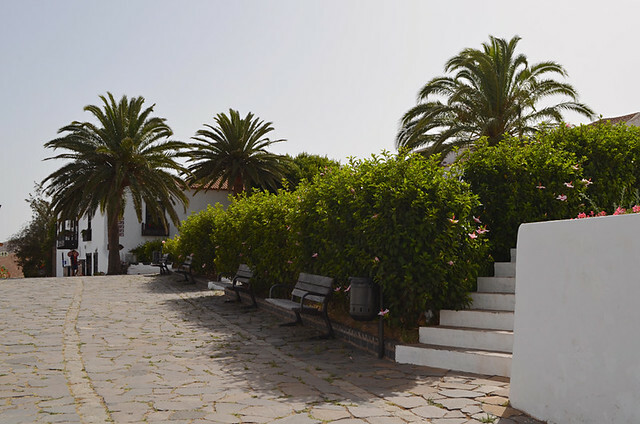 When it comes to rural tourism, Fuerteventura is some way behind the other Canary Islands. There are a couple of reasons which might explain this. 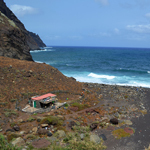 The more arid eastern Canary Islands don’t have as big a Canarian population as Gran Canaria or Tenerife. What traditional towns exist simply aren’t on the same scale as on Tenerife, Gran Canaria or La Palma. Therefore there isn’t the same local demand for restaurants. 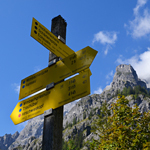 Neither do they have the same reputation as walking destinations, which attracts hikers to the rural parts of the smaller of the western islands. That means as well as a lack of locals, there’s a shortage of visitors wanting to eat away from resort areas after dark. Once the day-trippers depart, there’s nobody left who wants to eat in Betancuria… apart from us and a couple of other travellers who want to explore the hinterland. A couple of nights later we’re in Pajara, a bit further south. 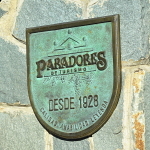 Historic Pajara is another favourite on the tourist trail. But it’s a bit different from Betancuria, it’s got a bigger local population. 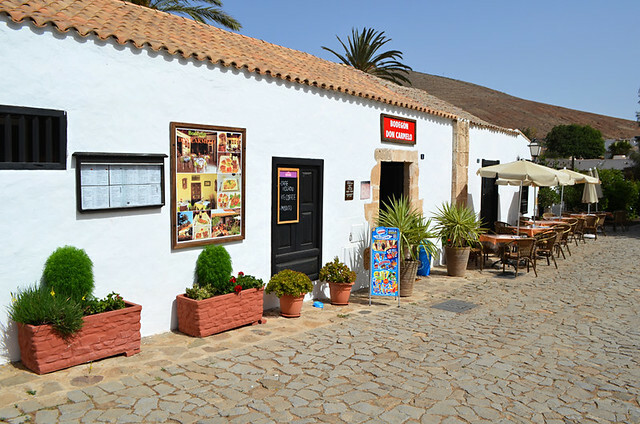 Many restaurants mirror Betancuria by closing after the tourists leave. However, a handful stay open to cater for the local population. We found exactly the same scenario in Antigua. After a long hot walk, there’s no problem getting a beer in a in a typical Canarian bar that doubles as a restaurant. These are no frills places. But they’re friendly, the food is usually decent, if basic, and is very good value as prices are aimed at locals. On our first night we wander into Bar Tasca Mencey Amanay opposite a small plaza where sack races are taking place. Conversation in the bar stops briefly. They’re not used to seeing tourists after dark. Again it’s friendly and the food is plentiful and excellent. There’s even a little creative touch – a fig on top of the salad accompanying tender cerdo frito (fried seasoned pork). The place has a great atmosphere. 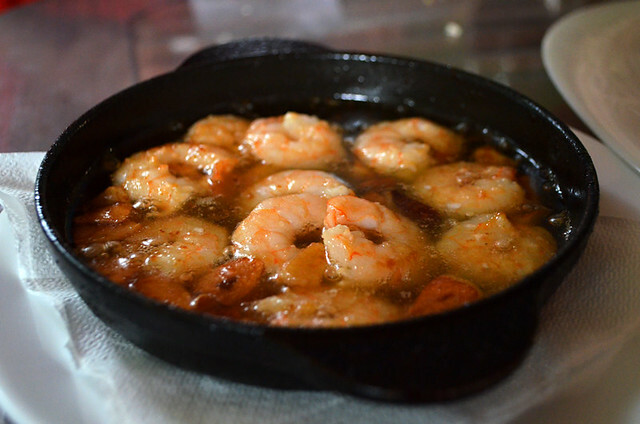 The following night we enjoyed tapas of queso Majorejo, gambas al ajillo, papas arrugadas and churros de pescado (local cheese, garlic prawns, Canarian wrinkled potatoes and fish in batter) in La Fonda, another restaurant that stays open after tourists leave, but only till 8pm. We like these places. They are honest, welcoming and authentic. But it helps massively if you can speak Spanish. We know from experience that there is such a thing as ‘too authentic’ for some people. 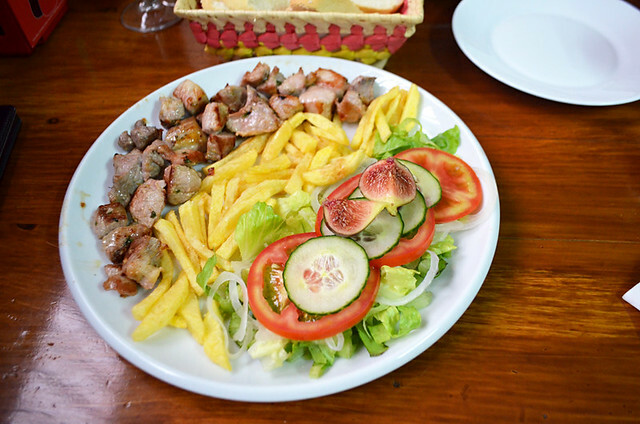 It’s slightly different in the north of Fuerteventura where Villaverde caters to people from nearby Corralejo on the coast. Lajares probably boasts the most diverse selection of restaurants of any location in the hills, thanks to the quirky fact it’s an inland surf dude town. 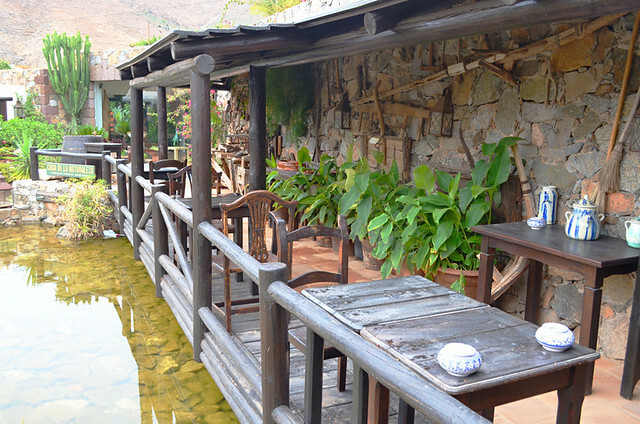 On the islands with a more developed history of rural tourism you also find basic Canarian restaurants. 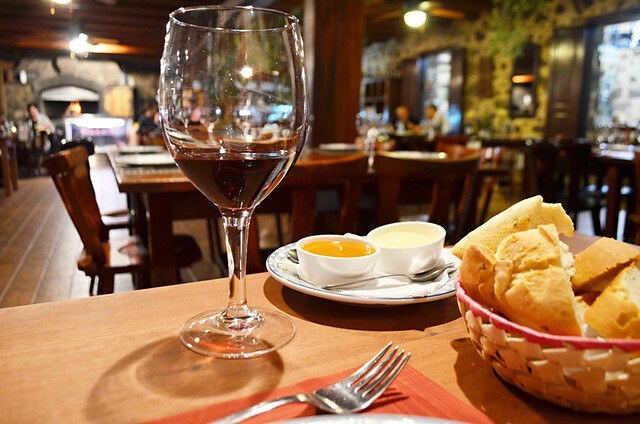 But there are plenty of other options, more ‘sophisticated’ traditional restaurants which might be primarily for locals, but which also feed their fair share of the type of visitors who prefer a more cultural experience in the destinations they visit. 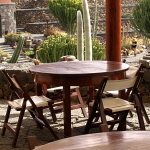 There are plus points as well as minuses to the limited choice of restaurants, and accommodation, in rural Fuerteventura. Venture away from the coast and, most of the time, your experience is going to be a truly authentic one. The fact that rural tourism is still in its infancy means that it will also be a quite unique experience as well. There’s a certain amount of satisfaction to feeling like a trailblazer.